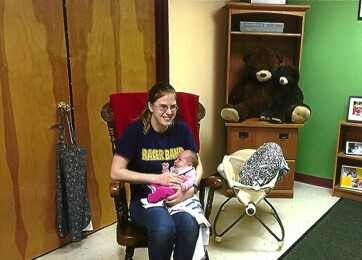 Sheila, the director of Childtown in Shelbyville, Kentucky, said she always welcomed breastfeeding families in her child care program; however, she did not understand how to fully support these families until she participated in the National Early Care and Education Learning Collaborative (ECELC). As part of her action plan goals, Sheila and her staff decided to transform their storage room into a breastfeeding room. After hard work and dedication from Sheila and her staff, Childtown Child Care now has a private breastfeeding room equipped with a glider, breast pump, magazines, breastfeeding resources and posters, a changing area and a radio. Shamaila Khan, owner of McLean Playtime Family Daycare in Virginia, created a quiet space in the basement of her home that allows mothers to breastfeed comfortably.